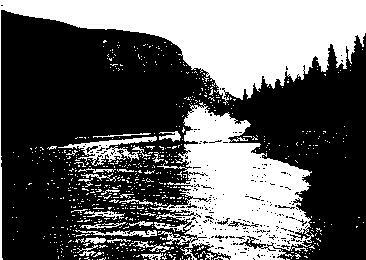 This photo appeared in the The Genealogical Association of Canada, Special paper Number 22, 1981. The caption under the photo read. 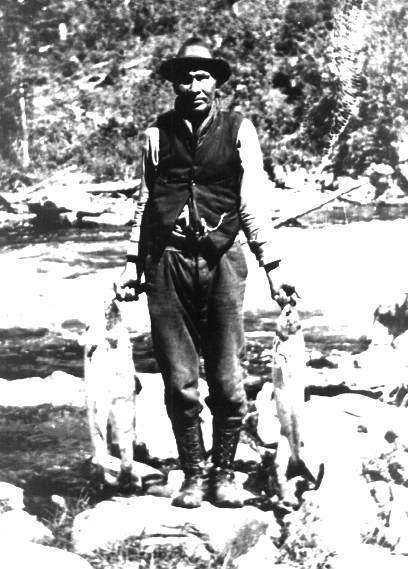 Matty Mitchell, trapper, prospector, guide, Montagnais Indian, born in Hall's Bay, Newfoundland, discovered the Buchans River Orebodies 1905. Photo courtesy Mrs. Jessie Chatwood, St. John's Nfld. Mrs. Chatwood's son Albert sent me a copy of the photo. The photo is an enlargement from a snapshot taken around 1917-1920s by Jessie's father. She and her father were fishing at Lomond and stayed at the home of Mr. Simpson, Manager of the St. Lawrence Lumber Co. 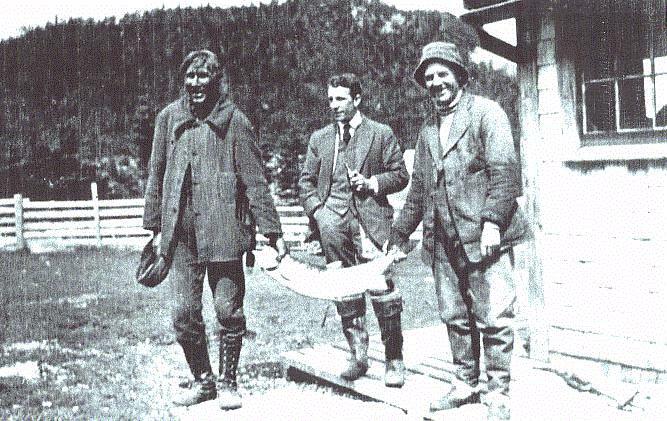 This photo was sent to me by Mr. Ray Neilsen, a gr-grandson of Mattie, with this explanation. "The picture was taken on the Lomond River, where Mattie was a guide for George Simpson and Duncan Boyd (we also have a picture of the three of them). George Simpson was the manager of the St. Lawrence Timber, Pulp and Steamship Company Ltd. who bought out a sawmill operation in the area, in Aug. of 1916 until his death in 1935. Duncan Boyd was the company accountant and later married Simpson's daughter. The picturie was among others given to Gros Mome National Park by Colin Boyd, the son of Duncan and Ella (Simpson) Boyd, when he came over to visit the area a few years ago. So the picture was taken between 1916 and the year Mattie died 1921." There is such a striking similarity between the details surrounding the first two two photos and the clothing Mattie was wearing, that it is possible the two photos were taken in the same year if not on the same trip. Ray subsequently sent me a copy of the "picture of the three" mentioned above. This photo showing Mattie with George Simpson and Duncan Boyd is interesting for a couple of reasons. One it shows how tall Mattie was compared to the average man of his day. Secondly it shows how youthful and healthy his appearance was for a man in his seventies. When I first saw the photo I thought it might be his oldest son Larry. This photo appeared in H.C. Thomson's paper, p. 197. (see Thomson's Journey Webpage). Thomson wrote that Mattie called it The Lake of Three Hundred Islands, but was subsequently named Lake Michel after Mattie by J.P. Howley in 1904.The caption under the photo read. Lake On Eastern Side of The Blue Mountain. The photo shows two people on a raft near a campsite on the shores of the lake. Since there were 5 people on the journey there is a 60% chance one of the people on the raft was Mattie or his son, Lawrence.